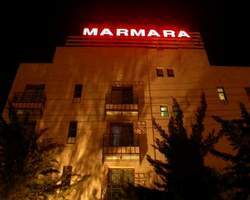 The Marmara is Located in the heart of the capital's business and diplomatic district of Amman, Al Rabya, a short 30 minute drive from Queen Alia International Airport. Suites and Rooms at The Marmara are elegantly furnished with a homelike setting to make you feel comfortable and relaxed. Double glazed sound insulated windows keep rooms quite at all times. Every room is equipped, a multi channel satellite TV system, point personal laptops capabilities or portable fax machines, automated telephone system and individually controlled room air conditioning. "The Right Place to Meet the Right People"
The Restaurant will serve you Breakfast, Lunch and Dinner in an Intimate Unique Atmosphere. Here Marmara Hotel will offer Marmara Hotel dear guest an International Menu with a special treat from the Italian Cuisine. Marmara Hotel has got all what you need for your party. Please pay us a visit to try one of Marmara Hotel offers to evaluate the quality and to choose from our list, the offer that suits your budget. The Marmara’s banqueting Hall The Mushatta offering a full service banqueting facility ideal for wedding and engagements. Over the past 10 years we have been honored to serve over one thousand happy couple who have chosen The Mushatta for their desired weddings location. Marmara Hotel in-house banqueting team works hard to please Marmara Hotel guest and meet their budgets.